NIAC, CASMII, AIC and other pro-Iranian regime organizations have built close relations with radical leftist and anti-war groups and use them to promote their political agenda. Most anti-war groups in 2006 were mainly concerned with the conflict in Iraq. This began to change after pro-Iran lobbyists and activists targeted the anti-war groups and convinced them to support a pro-Iran agenda. The initial foray into the anti-war network occurred at the London International Peace Conference on December 13, 2005. A participant was the newly formed Campaign Against Sanctions and Military Intervention in Iran (CASMII), which had been established two weeks earlier with the assistance of NIAC. Abbas Edalat, the head of CASMII, discussed its strategy in an interview with ZNet, a pro-communist website founded in 1995. Edalat said CASMII aimed to “mobilize opposition in the Iraq anti-war movement against any attack on Iran.” In January 2006, Edalat traveled to San Francisco and Boston to promote the new organization and its agenda. Step-by-step CASMII inserted itself into the anti-war network and began to use the groups to promote the mullahs’ agenda. The anti-war organizations gradually jumped aboard the pro Iran lobby. 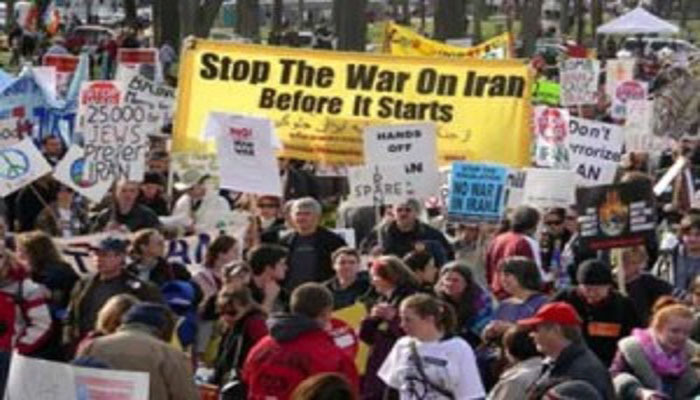 On April 29, 2006, United for Peace and Justice (UFPJ), one of the largest anti-war groups in the US, held a rally in New York City to demand the withdrawal of military troops from Iraq. At the event, Leslie Cagan, the group’s national coordinator, said the rally, in part, had been organized to protest planning by the US government for a possible military strike in Iran. A year after CASMII was created, its website displayed links to some two dozen anti-war bloggers and organizations, including Code Pink: Iran, Canadians Against War, Enough Fear, Common Dreams, Miles for Peace, Peace-Action, and Stop the War Coalition. To attract the support of the anti-war groups, CASMII framed the debate on Iran as one of only two options, either war with the mullahs or direct negotiations. Not mentioned was a third possibility – regime change – which was supported by President George Bush. In his State of the Union address on February 1, 2006, Bush urged the Iranian public to “win your own freedom,” a veiled call to the Iranian public to rise against the regime and replace it with a pro-democratic government. To assist Iranians achieve this goal, the US steered tens of millions of dollars to Iran-related pro-democracy groups. Not surprisingly, NIAC, CASMII, and other organizations in tow with the regime announced their opposition to the funding. Their efforts to halt the pro-democratic funds proved unsuccessful the first year. But when the issue came up for debate the next year, the political landscape had changed. NIAC distributed a letter in October 2007 to members of Congress expressing the opposition of 25 organizations, most of them anti-war groups, against the funding. Weeks earlier, NIAC had organized the anti-war groups to block a Senate resolution sponsored by Senators Kyl and Lieberman that condemned Iran’s violent activities in Iraq and urged the State Department to list Iran’s Revolutionary Guards as a foreign terrorist organization. NIAC’s letter falsely labeled the resolution as a “War Amendment” and claimed it would “bring the US one decisive step closer to war with Iran.” Stopping the killing of Americans and its allies in Iraq was deemed a “provocative measure” by NIAC. Among the anti-war groups signing the letter were: Network, A National Catholic Social Justice Lobby, US Labor Against the War, Council for a Livable World, Maryknoll Global Concerns, 3D Security Initiative, Peace Action, CodePink: Women for Peace, United for Peace and Justice, and United Methodist Church. Today, when NIAC wants to advocate a position on a Washington policy, it no longer presents the views of Iranian Americans. Instead, often enlists the support of a wide range of political and religious anti-war groups. NIAC, CASMII and other pro-Iran organizations have successfully infused their agenda into these groups and use them to support of the Iranian regime. NIAC has become a political puppeteer, manipulating far-lef anti-war groups, getting them to endorse the Iranian regime’s agenda. “The Future Is in our Hands,” Morning Star, December 10, 2005. “Stop the War Against Iran Before it Starts,” CASMII, December 13, 2005. “Iran, War, and Sanctions: Abbas Edalat Interviewed by ZNet,” ZNet, January 23, 2006. “Thousands March in Mass Anti-War Rally in New York,” Agence France Presse, April 29, 2006. Signatories included United for Peace and Justice, Maryknoll Global Concerns, Peace Action, Vietnam Veterans Against War, Council for a Livable World, Mennonite Central Committee, United Methodist Church, Green Party of Utah, and Nuclear Age Peace Foundation. “Coalition of 25 Organizations Lead Effort to Defeat Kyl-Liberman War Amendment,” NIAC press release, September 26, 2007. “72 Organizations Warn Senate Against New Iran Sanctions,” Press Release, NIAC, January 14, 2014.